You will need a basic understanding of Android development. If you are new to Android, see Building your first Android app for beginners. This quickstart uses Sceneform, a 3D framework for that makes it easy for Java developers to build ARCore apps without OpenGL. To use ARCore in your app without Sceneform, review the Enable ARCore documentation. 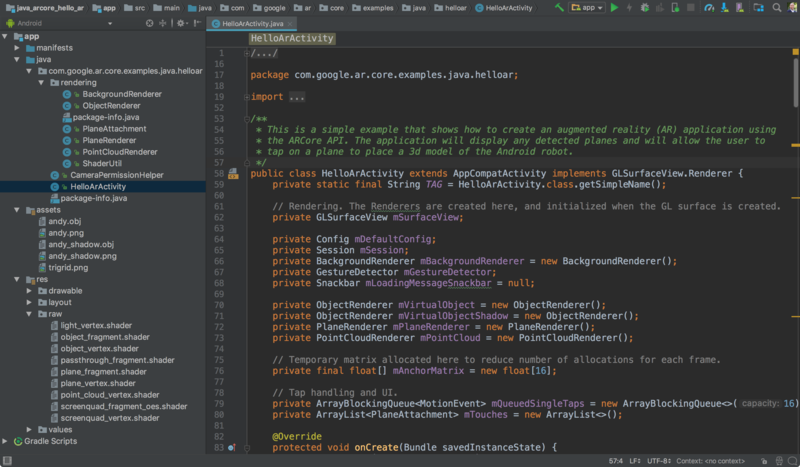 In Android Studio, open the Hello Sceneform sample project, located in the sceneform-android-sdk/ directory. You need Android Emulator version 27.2.9 or later. OpenGL ES 3.0 or higher must be supported and enabled in the Android Emulator. Make sure your emulator is configured to use the latest version. In the Extended controls panel ( on the Toolbar), select Settings > Advanced > OpenGL ES API level > Renderer maximum (up to OpenGL ES 3.1), and then restart the emulator. If you see ver 3 0 or higher version, then you can run Sceneform apps. If you see a lower version, then your desktop GPU does not support OpenGL ES 3.0 and you must use a supported device to run Sceneform apps. You may be prompted to install or update the ARCore app if it is missing or out of date. Select CONTINUE to install it from Google Play Store. The Hello Sceneform app lets you place and manipulate Android figurines on flat surfaces. Try building and running other sample projects in the ARCore SDK and Sceneform samples.